When Michele Catalano blogged yesterday using the title “pressure cookers, backpacks and quinoa, oh my!” it didn’t gain purchase until it was picked up by The Guardian. From there the story jumped to The Atlantic Wire which, 24 hours later, had more than a third of a million views. Catalano used to be the music editor for Forbes but now mostly freelances at The Magazine, Maura Magazine, and Boing. Her husband, Todd Pinnell, used to work as a product manager at Speco Technologies but at present seems to spend most of his days at home. 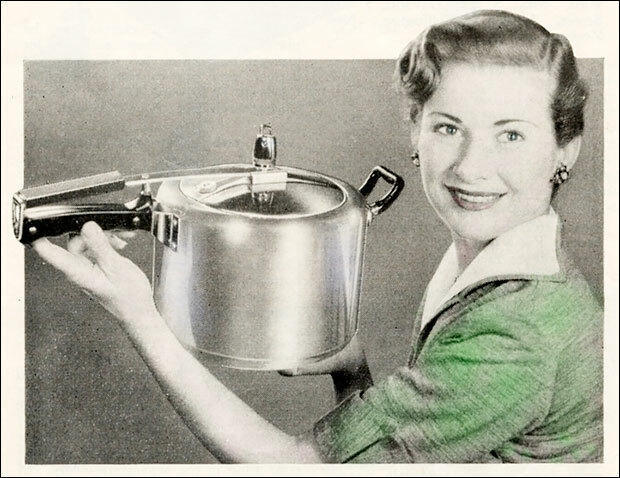 I had researched pressure cookers. My husband was looking for a backpack. And maybe in another time those two things together would have seemed innocuous, but we are in “these times” now. And in these times, when things like the Boston bombing happen, you spend a lot of time on the internet reading about it and, if you are my exceedingly curious news junkie of a twenty-year-old son, you click a lot of links when you read the myriad of stories. You might just read a CNN piece about how bomb making instructions are readily available on the internet and you will in all probability, if you are that kid, click the link provided…. The only problem is that, in this case at least, the people watching resided at her husband’s previous place of employment. After Pinnell left Speco, a routine cleaning of his office computer uncovered searches for backpacks and pressure cookers, and someone there called the police. It’s unclear if this was some form of retribution or genuine concern that their previously loyal employee was actually a budding terrorist. Only the Suffolk County PD were involved. Not the Nassau County PD or the FBI or its Joint Terrorism Task Force (JTTF). They could have been. Under different circumstances, they might have been. But not on Wednesday, July 31, at Catalano’s home. Six gentlemen in casual clothes emerged from the vehicles and spread out as they walked toward the house, two toward the backyard on one side, two on the other side, two toward the front door. “Are you [Todd Pinnell]?” one asked while glancing at a clipboard. He affirmed that was indeed him, and was asked if they could come in. After 45 minutes, finding nothing suspicious, the “six gentlemen” left, Pinnell called his wife, her genuine concerns about the surveillance state kicked in, and the rest is history. Local and state authorities work jointly with federal officials on terror investigations similar to the one Catalano describes. Both Suffolk and Nassau County’s police departments are members of the FBI’s Joint Terrorism Task Force (JTTF)…. Suffolk County is also home to a “fusion center,” a regionally located locus for terror investigations associated with the Department of Homeland Security…. The task force deputizes local authorities as federal marshals, including some in Suffolk and Nassau, who can then act on its behalf. Lessons learned? The surveillance net over the country is unnervingly omnipresent. Local law enforcement officers can be deputized and thus granted federal powers. And they will make house calls, where appropriate. On the other hand, Pinnell was only too willing to let the officers into his home without question. He failed to ask why. He failed to ask if they had a search warrant, signed by a judge, specifically noting the items to be searched, as guaranteed by the Fourth Amendment. He failed to exercise his right to remain silent. He failed to refuse to answer questions without his attorney being present. By letting them into his home, all Fourth Amendment rights he has disappeared and the officials were free to roam at will. And roam they did: bedrooms, living room, kitchen, back yard, and garage. That they found nothing was a blessing for Catalano and Pinnell. But they might have, and that evidence could have been used against them, even without a search warrant. Despite Catalano’s concerns about the loss of privacy, there is one other massive roadblock to the surveillance state: a human being — out there, somewhere — has to sort through the nearly unimaginable amount of data being hoovered by PRISM and other surveillance technologies in order to put the pieces together and build a case for an in-person investigation by local authorities deputized with federal powers. In the Catalano/Pinnell/backpack/pressure cooker case, however, the lead was handed to them on a silver platter.